Audre Lorde: Use of Anger; Sister Outsider. | AfroMadu. 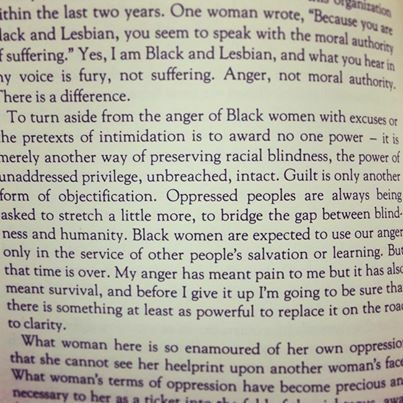 Audre Lorde: Use of Anger; Sister Outsider. The stereotypical thought of Black women always being angry, as shown in the text, is not to scare or send people away, but an outlet from the sense of rage that we deal with on a daily basis. The intersectionality of both race and gender and realizing that while idea of White supremacy is dawning on people, the patriarchal views of men ESPECIALLY Black men can be a daunting factor to Black women. Lorde’s statement, “My anger has meant pain to me but it has also meant survival, and before I give it up I’m going to be sure that there is something at least as powerful to replace it on the road to clarity.”, shows how anger is a coping mechanism to the oppression that is faced. As a Black women, this text was very relatable to my past experiences. Encountering racism on a daily basis and birthing rage from feeling oppressed only allows me to turn rage into anger and find ways to get through the dark tunnel of oppression. Audre Lorde’s work, here, shows that it is ok to be mad or angry about the situations you are in. This anger, if used correctly, is consciously making choice to not lash out on the things that bother you. Lorde shows Black women that we are all in this together and are feelings are noticed and have meaning to it. What do you think about the text? Let us know! Previous PostForty Days of Reconstruction.Next PostChanges to the SAT’s… Do we REALLY care? Black Women had all the right to be angry. Angry that society have been treated them like scum, like they’re not valuable, they’re not marriage, job, family material. That they’re asexual or worst, just sexual objects that can be destroyed or killed in the process. Reading the part of the book makes me realize that I’m not the only one who feels anger and in most of the cases it doesn’t show, it’s because the lack of respect, lack of trust and the lack of empowering ourselves. we definitely agree. How do you think we can empower ourselves? How can AfroMadu change that?